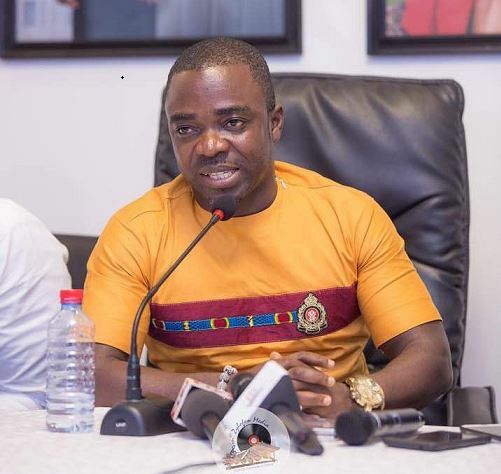 The Chief Executive Officer of Rufftown Records, Ricky Nana Agyemang, popularly known as Bullet has expressed utmost disappointment in Samuel Atuobi Baah (Sammy Flex), who doubles as Head of Communications at Zylofon Media and host of Zylofon FM’s ‘Showbiz Agenda’ over a comment he made on his show on Monday, abrantepa.com can report! Deeming the statement as disrespectful, Bullet on Okay FM’s Drive Time show rebutted in fury. “What are you talking about? Are you God? Do you know how much money we have? And can that money even save Ebony? Can that money bring her back? You don’t disrespect people like that! We’ve worked hard but… I don’t have a problem with anybody but for you to say Bullet cannot make $100,000 even in 20 years with Ebony… Do you know how much was involved in the Kasapreko Choco Malt deal? “She was to be unveiled in March. It’s disrespect to RuffTown Records, Midas Touch… How can you pay Ebony Reigns $100,000? Is she that cheap? A queen? I need him to correct that on his platform,” he fumed. “The amount invested in Ebony was even more than $100,000. How much is $100,000? Is Ebony worth $100,000? The biggest artiste in Ghana now; her bail out is $100,000? $100,000 is the price of Gadoe’s watch. That is not money. To respect her value as an artiste, you shouldn’t even mention $100,000. I don’t get it. Bail out in which way?” he queried. CEO of Zylofon Media came under criticism following his tribute to the late dancehall artiste, Ebony Reigns. His post sparked an outrage as some critics described it as unfortunate and unwarranted, citing timing as the reason for their stance. Some also argued that his post somewhat puts RuffTown Records, the label Ebony was signed on to, in a bad light, abrantepa.com observed. He however defended his post on Zylofon FM, saying it was in order. “Yes, I had a meeting with Ebony on Tuesday and sadly, that was the first time we met and last time we spoke. It was a possible signing discussion with an artiste which is the first stage to determine the artiste`s interest or otherwise. “In our discussion, she emphasized and it was agreed that before she goes out of the contract, she has to satisfy a termination clause in the contract by paying her record label Ruff Town Records an amount of USD$100,000 of which Zylofon Media was ready to fulfill. That was what she termed as a bail out and there was no way we could do that without reaching out to Ruff Town Recordz. “The citing of the quotation was my expression of pain, over the fact she had a WISH of which she couldn’t wait to be fulfilled. Just as others are expressing worry over her purported wish to pick up awards.There’s nothing wrong in stating that, she had this wish or that wish and hoping that wherever she is, she finds fulfilment”. After his defense, a penal discussion followed and that was when Sammy Flex made the statement. Ebony, real name Priscilla Opoku-Kwarteng, was returning from Sunyani in the Brong Ahafo Region when the Jeep she was travelling in crashed into a VIP bus on Thursday evening, according to police. Ebony was travelling with three other people, and two of them have also been confirmed dead. The two include a young lady, Ebony’s assistant, and a military man. She recorded hit songs like ‘Dancefloor,’ ‘Kupe,’ ‘Hustle,’ ‘Maame Hwe,’ ‘Date Ur Fada’ and ‘Poison’ under RuffTown Records.